Two rescued dormice at the Wildwood Trust have woken up today in time to celebrate the Royal Wedding. The orphaned dormice are two of four babies who were found in an old Land Rover after being abandoned by their mother. The litter was brought to Wildwood in September since then they have been looked after at the park by Wildwood's conservation team. Wildwood's Chief conservation officer Hazel Ryan said "when they originally arrived at Wildwood as babies we didn't know if they would be strong enough to make it through the winter but we they have done very well and although they are brother and sister I'm sure they won't mind being named after the royal couple." The first duties for the royal rodents will be to help boost dormice numbers in the UK via Wildwood's captive breeding programme. They will be paired off with other dormice and their offspring will be released back to the wild in areas where dormice have become extinct. 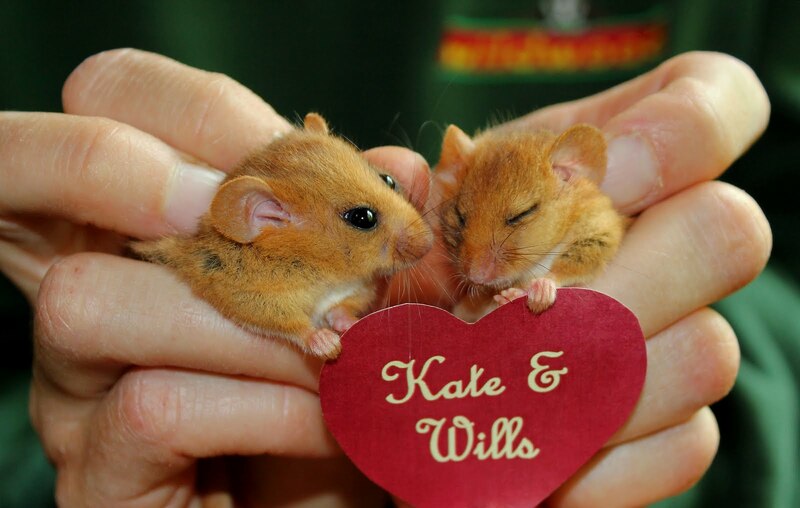 Wildwood has been successfully breeding hazel dormice for release for over 10 years we are sure that the real Wills and Kate would be delighted to know that their namesakes will be helping Wildwood to save one of the UK's most beautiful and elusive creatures. As a member of the National Dormouse Captive Breeders Group, Wildwood breeds dormice for reintroduction to Middle England where the dormouse is becoming extinct, through a mixture of habitat loss and unsympathetic management. Southern England is a stronghold for this species, but it is becoming increasingly rare elsewhere and is extinct in counties such as Cheshire and Yorkshire. The hazel or common dormouse Muscardinus avellanarius is the only native species of dormouse found in Britain. Dormice are a predominantly woodland species, particularly associated with broad-leaved coppice. Dormice are a 'flagship species'; by managing habitat for dormice, a range of other species will benefit. They are also important as 'bio-indicators' as they are particularly sensitive to habitat and population fragmentation1. Their presence should indicate that the area can sustain populations of other sensitive species. · Loss and fragmentation of ancient woodland, leaving isolated, non-viable populations, where even short distances form barriers to dispersal. · Clearance of hedgerows, especially after the Second World War, dramatically reduced the number of habitat corridors that were used by dormice to travel between adjacent areas. · A decline in traditional woodland management has led to a lack of coppicing areas or inappropriate coppice which can greatly reduce species numbers. Coppiced areas should create a patchwork mosaic of different ages throughout the wood, with an adequate diversity of woody plant species, predominantly hazel coppice. Coppice in irregular patches is essential, to allow some shrubs to be flowering or fruiting whilst others are maturing. This is essential between April and November, when dormice are awake after hibernation. · Damage to the scrub layer and coppice re-growth by large mammals such as deer and livestock, reduces the supply of particular foods necessary to dormice, as well suppressing natural regeneration. · Climate change has had numerous effects on dormice, due to their specialised feeding requirements. During warm winters dormice awake from hibernation more often, wasting energy as their body temperature warms, causing an increase in metabolic rate. It is also thought that warmer autumns lead to fruit ripening at an earlier stage, sending dormice into hibernation earlier as their food reserves dwindle. Wetter summers prevent dormice from foraging. · Plantations of evenly spaced, same aged trees provide uniform conditions which are unsuitable for dormice. · Dormice will travel extremely long distances in trees to avoid coming down to ground level. A barrier between two areas of adjacent woodland, such as a road, will decrease the potential for distribution. · Grey squirrels, an introduced species, consume autumn nuts at an earlier stage, leaving none for the dormice.